The City of Portland is searching for an HR Director. The city serves a citizen population of approximately 12,000 and employs approximately 150 full time, part-time, and seasonal employees. The governing body is comprised of a mayor, vice mayor, and six aldermen; the city management team reports to the mayor. The position of Human Resource Manager will report directly to the mayor and will be responsible for providing full-scope human resource services to fellow department heads, employees, and elected officials. Typical duties will include: development and administration of various technical phases of the city's personnel program, including policy development and administration; risk management; benefits administration; recruitment, selection, and placement; position classification and pay; employee relations programs, performance management, employee development, and workforce diversity; and providing advice to city management and personnel. One or more of the following certifications: PHR/SPHR, IPMA-CP/SCP. The Knoxville Area Transit (KAT) Agency is currently seeking candidates for their Chief Human Resources Officer Position. The position is responsible for coordinating and developing employee relations, benefits, training, staff planning, compensation, compliance, policies and labor relations for all KAT departments. Bachelors in Personnel Management, Public Administration or related field.Certification as a professional in human resources preferred. The position posting can be found at https://katbus.com/Jobs.aspx. The City of Chattanooga has a vacancy for their Director, Human Resources. Incumbents in this classification are responsible for planning and delivering comprehensive human resource programs to the City including recruitment, records retention, compensation, classification, employee benefits and wellness, employee relations, training and risk management. Duties include developing and implementing policies, procedures and programs that affect City employees; advising the Mayor on significant human resources issues; resolving procedural, operational and other human resource related conflicts and managing the department budget. Work is performed under administrative review, working with the maximum degree of initiative and judgment. Fourteen (14) years of any combination of relevant education, training or experience sufficient to perform the essential duties of the job will be considered. Six (6) years of human resources managerial experience is required. Examples of relevant education include a Bachelor's Degree in Human Resources, Business Administration, or related field. Examples of relevant experience include progressively responsible human resources experience. LICENSING AND CERTIFICATIONS: HR certification preferred. Mediation training preferred. The City of Savannah, Georgia is seeking a Human Resources Director. Savannah offers great weather, nearby beaches, and a tradition of hospitality and cultural happenings. This Human Resources Director manages the daily operations of the Human Resources Department, oversees administration of the Civil Service System and ensures compliance with applicable laws, policies, rules, and regulations. As a key member of the City Manager’s Leadership Team, the ideal candidate will demonstrate the ability to embrace change and help guide the City through significant organizational restructuring. Bachelor degree required, Master’s degree preferred, in Personnel Administration, Public Administration, or Human Resources Management; with five years of progressively responsible technical, personnel and supervisory experience administering a comprehensive human resources program; or any equivalent combination of education, training, and experience. Salary for this position DOQ of the selected candidate. Starting salary is expected to be in the range of $95,000-$120,000 with a comprehensive benefits package including health insurance, retirement options and negotiable relocation expenses. The TN Department of Human Resources has a vacancy for a Talent Management Administrator for the Strategic Learning Solutions Division. Under direction, incumbents in this class are responsible for professional talent management work of considerable difficulty and enterprise-wide scope, and supervisory work of average difficulty in strategically directing all talent management related functions for specified state government departments; and performs related work as required. This position reports to the Assistant Commissioner, State Chief Learning Officer, and serves on the Strategic Learning Solutions’ Senior Team. Incumbents in this class strategically direct all talent management functions (career planning, competency management, high-potential employee development, learning and development, performance management, leadership development, succession planning, recruitment, retention, and professional development) for specified departments or agencies enterprise wide, encompassing approximately 20,000 employees. Education and Experience: Graduation from an accredited college or university with a bachelor's degree in Human Resources, Adult Education, Instructional Design, or other related field. Master’s degree preferred OR Graduation from an accredited college or university with a bachelor's degree and two years of experience in Human Resources, Adult Education, Instructional Design, or other related experience. A copy of the job description is available here. The City of Murfreesboro, Tennessee, seeks a confident team builder with strong technical knowledge of human resources processes and practices to be its next Human Resources Director. A copy of the job description can be found at https://www.governmentresource.com/Murfreesboro_Human_Resources_Director.pdf?mc_cid=85cc12dc7d&mc_eid=4530c8f085. Are you responsible for your organizations' retirement plan. 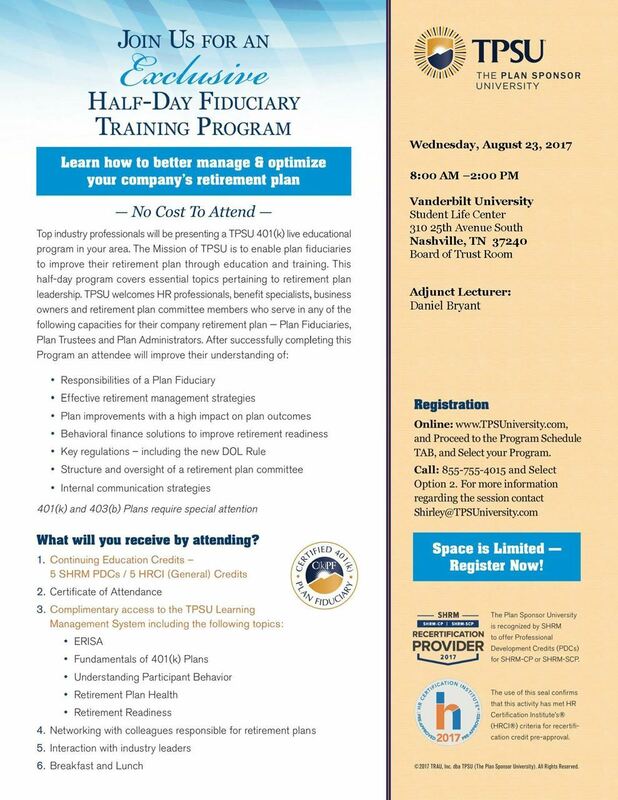 The Plan Sponsor University (TPSU) will be offering a free half-day fiduciary training program on August 23rd, 2017 from 8:00am - 2:00pm at Vanderbilt University on how to better manage & optimize your company's retirement plan. The program will be held in the Student Life Center (Board of Trust Room), 310 25th Avenue South. The program will cover topics pertaining to retirement plan leadership. The program has been pre-approved for 5 SHRM and HRCI Re-certification credits. There are reserved parking spaces in the Student Life Center Garage. You access the garage from 25th Ave S across from Memorial Gym into ‘Vanderbilt Place’, driving behind Schulman Center going into Student Life Center. 20 parking spaces are paid for through TPSU Program. For more information on the sessions or registration call 855.755.4015, ext. 110 or e-mail Shirley@tpsuniversity.com. You can also register by going to the TPSU website: http://tpsuniversity.com/ContentPage.aspx?NavigationID=185&PageID=183&callback=~/ContentPage.aspx. The City of Lebanon has a vacancy for a Risk Manager. Under direction of the Human Resources Director, the Risk Manager is responsible for the administration of the City’s risk management program, loss prevention, loss control/claims management, & safety. Qualified applicants must possess an accredited Bachelor's degree in Risk Management, Public Administration or a closely related field or an equivalent combination of education and experience. Applicants must have at least four (4) years experience in Risk Management with at least one (1) year's experience in the public sector. Certified Risk Manager (CRM) or Associate in Risk Management for Public Entities (ARM-P) would be a plus. A valid TN Driver's License and clean driving record are required. View detailed job description and apply online at https://tn-lebanon.civicplushrms.com/careers/ or email a resume, cover letter and salary history to careers@lebanontn.org.